Dougie Vipond presents live second-round coverage from the 2017 Scottish Open, at Dewars Centre in Perth. Commentary is by David Corkill and Paul Mitchell. Browse content similar to Day 2 - Live. Check below for episodes and series from the same categories and more! the younger man took the first set. weighted shot gave Chesney a triple. 9-3. Chesney into the quarters. There is confirmation of the result. his good friend Merv the Swerve. they know what is going to happen. He is in action today? Sony times and won that. been here so many times. King will be a very stern test. Greg, forced onto the forehand. just holds off a little bit. That is just hanging on to the line. Forehand again for Greg Harlow. It looks a little bit lazy. bowls, having to make the switch. Looking like he is arriving at this. the gap coming to trail the jack. come in and push the red bowls in. That is what he is really good at. Just slightly in front of the jack. Harlow. Responding with a draw. really good bowls by Mervyn King. this and why not? No great danger. great fourth bowl from Mervyn King. champion. -- an early lead. going away from the commentary box. behind. In low for Greg Harlow. right. Dropped back, good second. so you have to hang around. Greg Harlow got the Open hand. line to make the centre of the rink. A lot of jack hi bowls. Should not be in the way. Six inches past jack high. He might be tempted to run this. for this. Relatively wide targets. it going off the green that often. wanted to put that, I can tell you. Set up the target, he knows it. advantage, a bowl in the ditch. Well, that is just typical Mervyn. in the ditch was worth two. this to try and disrupt things. Perfect again. It does look harder. had the weight to hold it. shot, no doubt about that. exactly where he is bowling too. the draw or rested on for a double. The draw is more likely. before the bend takes effect. bend. Good use of the mat. nine ends featured nine shots. number 14 in terms of the rankings. Eight inches past jack high. the back or a miscalculation? out. He played outside the line. I am making contact with the bowl. By the end, he missed by 15 inches. It is holding a lot. he says that two will go against it. the end and the lead in the set. will chat throughout the game. That is a little. Has gone longer. away from getting what he wanted. bowl, there were three against him. thought when he got to look at it. One red and a measure. make the double. Goodness me. What a turnaround that is. hoping to keep that going. dropping a little bit short. weight as well. -- toiling a little. attacking shot down, red into green. That does suit his style of play. horrible. That is a shocking result. That green bowl would not be moved. Harlow needs two to tie this. last four years, that was last year. Greg Harlow stopping for a second. He has kept it in wide. It has been played over the weight. at the moment to do so. it in and take a chance on the next. bear to be taken out. bowl, he might go for the two green. jack. He just did not push it. danger is not over for Mervyn King. be taken out with the other two. backhand shot, split the two red. to go for the set win. It looks better. The shot is drawn. Mervyn will just draw it in. to promote the right way out. by a good final bowl. Mervyn's bowls not as strong as his. That looks better, didn't it? Mervyn will try for the jack. weight. Got a chance with this one. the low side of it. bowl clean, the jack moved. No result for Mervyn King there. sometimes you go for it anyway. Certainly an adjustment on weight. How close is he going to get? About a foot short of jack high. King was going to play. Had won there, didn't need another. That is the shot. You would think! close. Interesting shot by Greg. Going to get a touch on the jack. An important bowl from Mervyn King. full length, with no messing about. expect Greg to beat it. much underneath of his own bowl. pull that again? He came way under. go a little bit faster than normal. choice. He might have to go again. Take the risk of losing a four. He is going for it. have had in that match. have got a good result. Well, Mervyn slots another one in. on two or three shots again. is on the front inside edge again. third bowl. Well done. Big recovery. as you will see from Mervyn King. Always better to reset yourself. That is what Greg Harlow has done. That is a funny old end. preferred route now for Greg Harlow. running bowl. Making a gap. Yes. this to force a tie-break. That is a better one again. can see, effectively, from the mat. Interesting way to describe that. Now, that target is a horrible one. it. At least, very close to it. out, he is looking at losing a four. think he is in so much trouble here. win. Can Mervyn deliver here? This could change the complexion. champion is in a heap of trouble. not quite right with this one. did not look good, it was short. forehand, I would have thought. mistake. Really needed that one in. That was the pressure bowl. for a four against Mervyn King. difficult to get out now. A bit of Harlow Magic. It keeps him in touch. game for lots of reasons. Mervyn has a really bad and. saying, thanks very much for that. Not very sporting of him. out. Mervyn King gets his scalp. way. A lot of close stuff going on. Mervyn King was on fire at times. Playing some beautiful draw shots. it just didn't go his way, did it? opponent. Doing a fairly regularly? must be feeling pretty confident. Mervyn through to the quarterfinals. Dawes and Paul Foster coming up. me. I don't see why not. points just to stay in the top 16.
played him last year in the last 16. It might have been a tie-break. a long time at international level. Let's get the players into the rink. tie-break victory over Graham McKee. Thomson has joined Paul Mitchell. Interesting talking to Mark Dawes. Foster, and he's got a chance. put any nerves to the side. don't think you will be overawed. Some players might be, playing Paul. I don't think that Mark will be. sets. Both within eight ends. the first bowl is lying first shot. did not want to comment. Foster asking if it is two or three. Doing a little check. One short. cope with in round one. It is good again, perfect. just to come to those two red bowls. third locked in. That is excellent. exceptionally lucky to spin away. think he has gone back to the trawl. well played. He was unlucky. on Earth that escaped through. played, Mark. That is very unlucky. three, but only picking up a single. suggesting a back bowl here. you are just going to get wrecked. Foster. He could move his own. he is going to have to draw it. think he had drawn that. just a little clip at the side. but he is on the board. He has found his line, Paul Foster. Paul has got him to remove another. Well, will it be deja vu? can't see him getting a bad result. way he has played that hand. is number three. Brilliant bowls. beard to Perth this year. your co-commentator also has one. a nice shade of grey. be fair, I also looked ridiculous. think I will steer clear. advantage, two apps to Paul's one. on here? He thought he was too wide? that point in the set, four down. just seen three exceptional bowls. replaced by his new shot of the day. Began, good reply. -- again. Voice command on his bowls. trying not to use a time-out. that shot on giving him some room? That is a miss and he knew it. hand doesn't allow you to play it. The weight is better this time. fancies he has got a shot. three shot lead in the opening set. I think he is reaching. Again, some thinking for Mark to do. Wasn't far getting around that. may get a result here yet. own. He did not hang around. Clear run scores, well played. knew exactly what he wanted to do. fantastic between the two of them. has yet to win consecutive ends. the back football the time. correction. The shot is coming in. be playing this bowl by choice. indicated he didn't like the bowl. he is going to have to run at this. the backhand into his own. Mark could have been more positive. bowl to win the opening set. single year is exactly the same. a chance may be later on. with that. With every reason. Yes. be the shot that is a useful bowl. this is an awkward heady for Paul. ignore the bowl on the wing. Yes, he doesn't like it. Foster will take the opening set. deserved to win the first set. long as it is at home. quarterfinal. Paul is not there yet. the right way from Mark Dawes. character. A very good temperament. difficult to get the result. That is attacking. He likes it. Playing into it. Well played. He is going to end up with one. superb bowl again. Onto the respot. took the first set 10-4 last season. Again, a good first bowl. Two players, both with good bowl! shots to play and take bowls out. bit of running to hold this one up. forehand. To rest the red bowl out. Chose how confident he is. in this direction too often. A well-known fan of Glasgow Rangers. the eighth tier of English football. football, a bit of golf. with the way he's playing. being forced into shot after shot. Indoor Singles, The English Singles. He has had a terrific year. Commonwealth Games in a few months. The Gold Coast in Australia awaits. Paul will not be going near this. if he draws into this. the one. Defend the one. not an easy one for Mark. where he will get a bad result. catch the eye. No doubt about that. I think he is saying, good luck! only get worse, you suspect. This looks a better line. forced him out of that little bit. effect it has two movie round. The winner of this tournament twice. He is hanging in, isn't he? Just. the score in this end. Paul. He has got to hit this. than the very fast drive, timing it. critical of him for that? long. Jack delivered very gently. as short as this, if this is up. from Mark, a good tactical change. Foster, in his fourth International. He made his debut in 2014.
has a bowl to play. target. Two stay in. Still two down. Mark should play a third shot here. here, I think still a backhand draw. full-blooded. The jack is broken! have never seen that before! coming out of his paycheque! another part is off the rink. the bigger half would have counted. then it is going to be a measure. going off. They are going to check. got to be the respot. right. That is the right call. right not to be happy. and it has to go on the respot. time I have seen that. of the top came off. was right. Because it was going off. He has poked it into the ditch. He hasn't even split it in any way! to the respot, it was tremendous. you say, Mark Dawes has played well. apart from the draw for Mark. has been going uphill. He tries it. Well, this could be the final end. fantastic! It has just been great. played his part in this game. was meant to be there. Trying to push this green ball out. incredible. Never seen that before. It was eventually put on the respot. 6. The touchers. Out-gunned there. best match we've seen here all week. I'm delighted how I've been playing. get in. Paul will play very well. leave them that far away. the split jack. Talk us through it. happy with what the umpire said. Never seen it. Never done it. going that way. It was only fair. you a two. He was on the spot. Mark. Nev come across him before. to qualify through the tour card. different to every rink you play on. better. Have you to know it. before and get on with how you play. breath back after that match. showling pretty good form as well? in the entry route to the top 16.
as well. Always a hard competitor. to go through five matches minimum. you're starting to feel a bit jaded. Running through a little here. stuff for the first end. does not use his left hand at all. to find a new line. all three WBC singles events. in between 16 and 20. Doing its best to get back. is half an inch short. needed a little bit more. that head with a guaranteed weight. but a lot of players do not. does not seem to engage at all. way down! He thought it was safe. backhand. Let's see what he does. bang on target. No doubt about that. Over the weight this time. two. But singles there after. 2015. His club mate Andrew Barker. together as a pair, the two of them. Foster which is no disgrace. miss it, keep your bowl on the rink. stay? It has. Not a bad place. to the side of the re-spots. time. Certainly a lot closer. ball decides to go nowhere near it. they? Everything's gone so quickly. Michael gives one of his big drives. sliced off like a boiled egg. been a much harder decision to make. a bright idea. For lots of reasons. camera goes into the carpet. always going to be facing front. again. Little touch on that. into. Two down, seventh end. Yeah. No waste of time with this one. it stunned then it came once more. bowls and the fluke has got it. Tour. Two up, two to play. first two bowls, Michael Stepney. you're playing bowls up there. before. Beautiful in the sunshine. Just not enough sunshine sometimes. from that in the UK. been playing. Likely two green. just on the edge in terms of pace. needs to move it a little bit. Try and draw the shot. Needs to save the set. method of getting a four. first set to Michael Stepney. he has to hit the button so quickly! That is a better first one. He has got a chance with that. the gap is six inches. forward and struck a green bowl. Plenty of room to draw. REFEREE: Jack length, 24.5 metres. He did touch on the high side. at the back took his red one out. really should be drawing this. unlucky. A good second bowl, though. just keeps him in it. the other it looks green. the jack. It looks like a double. REFEREE: Two shots, Michael Stepney. about getting out of trouble. see them. Close to it. . REFEREE: Two shots Michael Stepney. Martin. His third ball was better. to get away from him. excited. He openly admits that. as long as it doesn't put you off. you have to have the knowledge. bother to start the shot clock. all about getting back. He has. bit too much on it. He's very close. one. He may with have done it. REFEREE: Two shots Perry Martin. he's on the card in this second set. Jack length 28th 5 metres. as laid back as they come. lazier. Not a time to go walk about. Not at 5-2 with five ends to go. come right into the jack. jack. Has to run. Oh, he's got it. the one. Needed to go past it. lows of following the Dons. Jack leant is 44.5 metres. for supporting his local team. that's a whole lot different. Two shots but a bit of a target. Perry's left armed just sits there. want to play ball at all. accurate drive most of the time. the hardest shot in a portable rink. anticipate even stop on its own. He's in control, Michael Stepney. Looking at a quarterfinal place. here and it's all over. That's better. Not a toucher. very close to giving the shot away. fact he is going to lose a single. He has called his first time out. stage last year, Wayne Willgress. is happy to surrender the one shot. The gap is 16 inches. way but it just ate up the weight. to give him that bit of extra. Just the one shot. It was enough. what he can do, no doubt about it. be very happy with how you played. on sticking in and to get better. before. Just how different is it? win in the first round? is all square in the third end. shouldn't play this on the forehand. the jack would be good to there. one. Forehand's the choice really. edge. Oh, he didn't get the edge. dear. How on earth did he miss that? about maybe a different weight. clear half hour before on the rink. an effort to get back at the end. backhand. Wing the bowl off clean. the wide side but no damage done. REFEREE: One shot, Jamie Chestney. back in March. He played very well. a very handy ball. Yep. might be tempted to run these now. expect Jimmy to get close with this. help. Looks like second shot. The ball did struggle to get back. to centre rink. Another single. round match. Daniel from Israel. second set which isn't unusual. from Israel, 14-0 the first set. more his drawing weight will suffer. certainly go deep, I'm sure of that. The gap is eight inches. has to play into it on the backhand. trying to get the edge of the jack. the last two ens. -- ends. 16, he wanted to make his mark. bowl will be enough to move it out. It is now a four inch gap. at the bottom of the rink. I didn't fancy it that much. played very well in the second set. out by his great friend Mervyn King. of the draw -- the other matches. us but he did. He played so well. confident, could he go all the way? Hard to beat in that form. 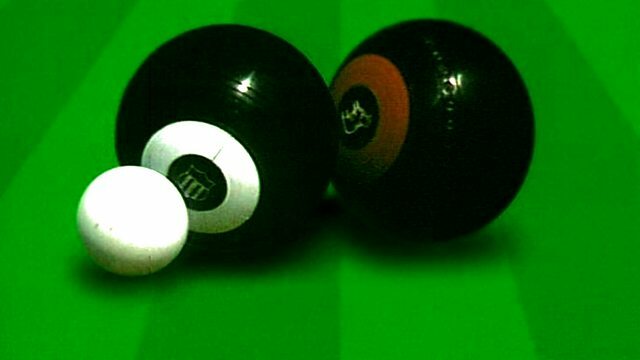 Second round action begins in Perth, and the form book would suggest that Greg Harlow will be continuing his campaign for three Scottish International Open titles in a row, while reigning World Indoor Bowls Champion Paul Foster should also be in action. However both are likely to face a stern second round test today. Dougie Vipond presents the programme, while Paul Mitchell and David Corkill provide the commentary.